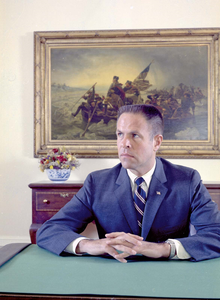 Harry Robbins "Bob" Haldeman (better known as H. R. Haldeman; October 27, 1926 – November 12, 1993) was an American political aide and businessman. He served as White House Chief of Staff to President Richard Nixon. He was involved in the Watergate scandal. Haldeman was born on October 27, 1926 in Los Angeles, California. He studied at the University of California, Los Angeles. His role in the Watergate cover-up precipitated his resignation from government. Haldeman was tried on counts of perjury, conspiracy and obstruction of justice. Haldeman was found guilty and imprisoned for 18 months. Upon his release he returned to private life and was a successful businessman until his death from cancer in 1993. Haldeman died on November 12, 1993 in Santa Barbara, California from stomach cancer, aged 67. ↑ Severo, Richard (November 13, 1993). "H. R. Haldeman, Nixon Aide Who Had Central Role in Watergate, Is Dead at 67". New York Times. Retrieved May 4, 2010. H. R. Haldeman, who spent 18 months in prison for his involvement in the Watergate scandal but said he believed his role as President Richard M. Nixon's chief of staff was the "mountaintop experience" of his life, died yesterday at his home in Santa Barbara, Calif. He was 67. A son, Hank, said that the cause was an abdominal tumor and that his father had been ill for a month.